Okay, it does look a little bit creepy. 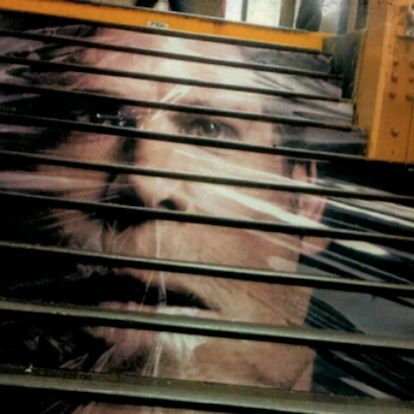 And yet the most ridiculous lawsuit of the day still goes the woman blaming a Dexter poster in between steps at Grand Central Terminal for making her fall. “The combined nature of the ad along with its placement poses a hazard to people on the steps,” said a lawyer for Ajanaffy Njewadda, the wife of a former Gambian ambassador, to DNA Info. She allegedly lost her husband in a crowd last year and when she saw the face of a serial killer while looking for him, she tripped down the stairs, breaking her ankle and suffering a concussion. Now she’s suing both the MTA and Showtime for the “shocking and menacing” ad for the show’s eighth and final season. “She was having nightmares about it,” said the lawyer, adding that his client had to see a psychiatrist. “It’s advertising gone amok.” To be fair, eight seasons of a Showtime show is truly scary. Shudders.